There are two definitions of agility. Random House Dictionary defines it as “The power of moving quickly and easily; nimbleness,” and “The ability to think and draw conclusions quickly; intellectual acuity.” Some of us might hear those definitions and watch traditional dog agility and think, “No way could I do that!” Oh contraire! Agility is adaptable, and truly a sport for all. And, as you’ll see, critters of all types play the game their own way. For some it’s a sanctioned events with titles to be earned. For others, it’s a way of bonding animals with family, occupying their bodies, keeping them fit, challenging their minds, and having fun.One great thing is that in most instances agility doesn’t require a lot of money or special equipment. To enjoy this sport all you need is the ingenuity to use what you have to put together solid props. Then it’s all about the play. Rabbit agility is rooted in and very similar to courses traditionally run by dogs — on a smaller scale, of course. However, some bunnies just like to hop, or are more suited to height and distance jumping. For them there is Rabbit Hopping. This sport is all about jumping, and does not include equipment for climbing, tipping or tunneling. In seeking the scoop on local rabbit agility, Spot located a diamond in the rough in Gladstone, Oregon. The Happyrock Hoppers rabbit agility group is comprised of adults, kids and seniors who meet at Somerset Assisted Living, the group’s sponsor. The Hoppers meet weekly to learn, practice and hone their skills in hopping, handling and showmanship. The sport is a wonderful way for people to not only learn more about and bond with their rabbits, but to meet new people. The experience enriches people of all ages who share a passion for animals. Tami Ingram, Somerset’s Activities Director, grew up in 4H and still raises rabbits today. Somerset resident Dave Kane had coached girls’ softball for many years and loved it. Ingram had been seeking a way for Kane to work with youth again when the idea for a rabbit 4H group arose. While exploring possibilities, she discovered rabbit agility. Ingram thought it was a joke at first but soon learned that, no joke: rabbit agility is very popular — just more so overseas than in the states. Once the group was formed and gained membership, they voted to focus on rabbit agility and hopping to build and maintain the bond with their pets. The group is part friendship, part showmanship, part community advocates, and wholly about fun. Members participate in conformation along with just about anything else their rabbits are willing to try. Conformation is a sport of a different color altogether: it’s about structure and breed standard. In traditional canine agility the most common breeds run are Border Collies, Shelties, and Australian Shepherds. Asked if there was a specific breed of rabbit more suited to agility or hopping, Ingram had this to say: size matters! The largest breeds such as the Flemish Giant, English and French Lops, and Angora’s can be likened to a Clydesdale or Draft horse running the Steeplechase — not so well suited. And, considering the substantial risk for back and hind leg injury for rabbit agility competitors, they say in their experience breeds that tend to fare best are Holland Lops, Mini Lops, Dwarfs, and some Dutch and mixed breeds. That said, it’s all about the rabbit’s interest and willingness to jump right in. At this point you might be wondering how in the world one trains a rabbit. Do you lure with a carrot? Lay out a little trail to be followed? Ingram says for the most part a rabbit will either get it or not. They usually start with a little nudge or gentle lift of the back end to inspire forward movement. Some bunnies catch on quickly and from there it’s all ups and downs. Ingram does note that like most things, consistency makes a difference. To sustain interest and fitness, hopping and agility should be treated like any sport, with regular training. Ingram recommends daily practice for at least 20 minutes, at least at early on. And surprise, surprise — most buns work for hugs and kisses! So much for that carrot lure! Bunnies are an affectionate sort — how fun is that! A few other random facts about hopping and agility with bun-buns: they love it cold and hate heat. In fact, heat is detrimental to their well-being. Also, rabbits are not meant to be cage animals. They thrive on interaction with people, toys, and other stimulation and activity. Plus, they’re smart. Really — they can have a vocabulary up to 25 words! In order to promote good rabbit stewardship and to let people know that rabbits may not be for everyone, the Happyrock Hoppers participates in community events to share their rabbits and teach responsible ownership. Learn more at HappyRockHoppers.com. Most cats’ first lesson is where the litter box is. Usually no more is necessary as the rest is instinctual. Noting how easily they learn the cat box, why not consider teaching the cat them other tricks? They’re naturally athletic, energetic, nimble and quick. Some cats, like Buzz, a SW Portland kitty living in a house full of dogs, don’t even require cat-sized equipment. Buzz just hops on, over, and through his canine siblings’ equipment in the back yard. “Ironically,” says mom, Jessica, “Buzz was supposed to be a feral cat.” Buzz says, “What’s good for the dog is good for the cat. Now where’s my reward?” By working with their instincts to play, chase, and pounce, familiarizing cats with obstacles is little more than a game. And, it’s never too early to start some types of training. In our quest for frisky felines playing agility, we discovered some organizations seeking to grow awareness of the sport. The Cat Fanciers Association (CFA) has been hosting feline agility since 2004. Competitions are open to all cats; learn more at Agility.cfa.org. CFA’s website boasts a training page, videos and tips, including how to play with your cat, training in line with instincts, and using marker words for desired behaviors. Jill Archibald, who hosts the videos, also offers suggestions on familiarizing your cat with competitive environments should you decide to participate. Another organization, International Cat Agility Tournaments, aims to help cats play at agility in ways that display their speed, coordination, beauty of movement, physical condition, intelligence, training, and the quality and depth of their relationship with the human who trains and guides them through the course. Specifications for equipment and training are available online, offering yet another way to play. Most birds are naturally a bit acrobatic, routinely displayed during play with the oft-brightly colored toys designed for them. Birds dangle, swing, and generally have a great time (a blast to watch) on their toys — which often feature bells, ropes and vivid hues. Of course, there are the non-swinging birds, too, and they too can learn many things. It’s true: your garden variety egg-layer can learn agility. Seattle-area dog training guru, Lisa Miller-Selthofer of Spot On Agility, attended Chicken Camp awhile back at Legacy Canine in Sequim, Washington. She says she was inspired to attend because, “I’m always looking for information on the best way to train dogs and kept hearing about Chicken Camp.” Admittedly, she thought it sounded a bit goofy at first, but others who had attended raved about the experience. So off she went! 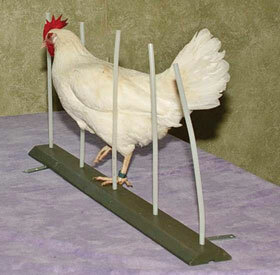 So how does teaching agility-type skills to chickens translate into the dog agility-world? Well, when it comes to dog agility, timing is everything. In everything from body positioning, verbal commands, and forward and lateral movement, the dog must know what it needs to know way earlier than us poor humans seem to realize or sometimes feel capable of. With chickens, Selthofer says, “The chicken’s pecking is so quick; students are forced to learn the merits of precise and accurate timing [in delivering rewards].” Chicken Camp trainers also point out that trainers are not bonded to chickens; chickens don’t have big, brown (pleading!) eyes; and they don’t have bad chicken-training habits. Chickens offer a fresh start to training from an entirely new perspective — and they’re surprisingly trainable! Selthofer says she came to realize again how incredibly smart animals are through this experience. She referenced a winning formula as: 1) Allowing the animal to figure out the task; and 2) Rewarding them for their efforts. By applying this formula she said chickens readily accomplish complex tasks. That said, in applying that experience back to her more traditional students — dogs — she recognized how much they compensate for our unclear signals and how hard they work for us even though we often fail to reward their efforts. Chicken Camp taught her to teach dogs from their point of view, which she says has dramatically improved her accuracy and length of training time required. So, cats, rabbits and chickens all have their own agility specialties. But smaller furry (and in one case, scaled) family members are playful, too. From mice to rats, gerbils to hamsters, guinea pigs and even a Bearded Dragon, there seems to be no limit to who might participate in this enriching sport. 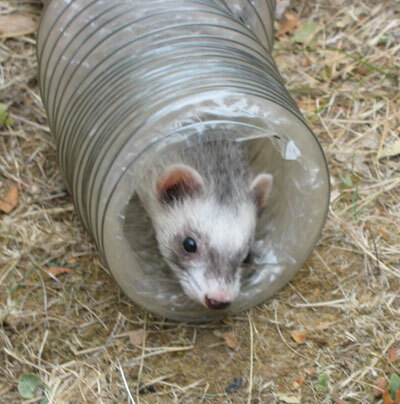 Ferrets even get in on the action, but typical of these energetic and slinky critters, they like to do it their way — skittering through tubes, pulling weights, and digging. There’s even an annual ferret “Olympics” in Lane County, hosted by the Lane Area Ferret Shelter and Rescue. Clearly the sky really is the limit with agility. Despite its definition, participants needn’t be spring chickens, or perfectly coordinated or quick, to play. Young or old, scaly or hoofed, it seems every imaginable critter can participate. Hopefully you’ve learned that all it takes is a little ingenuity, a few treats or willingness to cuddle, some patience and love, and you too can be an agility guru . . . with your cat, chicken, rabbit, hamster, rat, mouse . . . or any other creature who’s got your heart. Posted in Life with Pets, Feature, Behavior/Training and tagged with Agility, Sports, Rabbits, Chickens, Canine Games, Reptiles. April 1, 2012 by Kennedy Morgan - Spot Magazine.